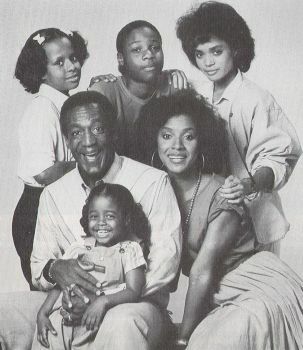 The Cosby Show was the most popular series on American television in the late 1980s. The situation comedy, which ran on the NBC network from September 1984 to April 1992, was based on the standup comedy routine of its star, Bill Cosby. The show focused on an affluent black family without presenting racial stereotypes or standard one-line jokes to generate audience loyalty. The series was not initially expected to survive against its competitor Magnum P.I., a drama airing on CBS in the same time slot, but it quickly moved to the top of the ratings and revived a dying sitcom genre. The Cosby show inspired other successful sitcoms including Seinfeld, Everybody Loves Raymond, and Roseanne, which were also based on standup comedy routines. Bill Cosby played the role of the affable Dr. Heathcliff “Cliff” Huxtable, an obstetrician/gynecologist who along with and his wife, Clair (Phylicia Rashad), a successful attorney, headed an upper-middle class African American family in Brooklyn, New York. They lived in a brownstone at 10 Stigwood Avenue where they raised five children, Sondra, (Sabrina Le Beauf), Denise, (Lisa Bonet), Theodore (Malcolm-Jamal Warner), Vanessa (Tempestt Bledsoe), and Rudy, (Keshia Knight Pulliam). Most stories revolved around Mr. Cosby’s observations on raising kids. His fear that the children would never leave the house, once grown, was a running theme in the situation comedy as was Clair’s wit and diligence in the ongoing effort to keeping her husband’s unhealthy eating habits under control. The show was conceived by executive producers, Marcy Carsey and Tom Werner, who left the ABC network to start their own production company. Carsey and Werner had produced earlier sitcom hits Three’s Company and Mork & Mindy. Nonetheless, a comedy based on the lives of an upper-middle class black family was new territory for the producers. They hired noted black psychiatrist Alvin Poussaint as a consultant to help The Cosby Show exude a strong yet subtle racial pride based solid middle class values. Still the show drew criticism from whites and blacks alike who accused the Huxtables of being a black family in white face. That criticism opened an important national conversation about race and class two decades after the civil rights movement challenged the place of African Americans in U.S. society. Mostly devoid of overtly racial themes, the show was able to present a storyline revolving around the trials and travails of a middle class family that happened to be African American. Many leading entertainment figures, such as Lena Horne and Stevie Wonder made guest appearances while jazz and blues music either sweetened the soundtrack or were integrated into the storylines. Clair was often seen reading a book by a noted black author while paintings and other artworks by African American artists were displayed on the set. The show often embraced serious subjects, such as teen pregnancy and dyslexia, the latter inspired by the experiences of Cosby’s real life son, Ennis. After an eight-season run, which included more than 200 episodes, the Cosby Show ended in 1992. During its run, the show garnered a number of honors, including the Emmy, Golden Globe, and NAACP Image awards. The show’s significance was indicated with its last episode. When Los Angeles, California erupted on April 29, 1992 over a non-guilty verdict following the brutal police beating of Rodney King, the finale was slated to be pre-empted. Los Angeles Mayor Tom Bradley, however, convinced NBC to air the series finale on April 30, 1992 in hopes that it would symbolize the ability of the nation to move beyond its racial divisions. Linda K. Fuller, The Cosby Show: Audience, Impact, and Implications (Westport, Connecticut: Greenwood Press, 1992); Marianne Ruuth, Bill Cosby, Entertainer (Los Angeles: Melrose Square Publishing, 1992); Donald Bogle, Blacks in American Films and Television: An Encyclopedia (New York: Fireside Press, 1988). (New York: Fireside Press, 1988).